Pinocchio, Gusto Mo Bang Maging Tao? will be staged by Tanghalang Pilipino from November 28 to December 13, 2009. This coming Yuletide Season, Tanghalang Pilipino, the resident theater company of the Cultural Center of the Philippines, is proud to announce the restaging of Pinocchio, Gusto Mo Bang Maging Tao? It will be mounted at the Tanghalang Huseng Batute (CCP Studio Theater) from November 28 to December 13, 2009. Filled with songs, fantasy, humor and colorful costumes, this adaptation by George de Jesus of the well-loved classic tale of Carlo Collodi aims to delight children of all ages. 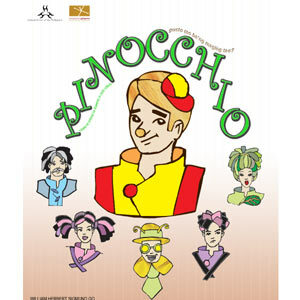 Originally directed by Herbert Go, Pinocchio, Gusto Mo Bang Maging Tao? is about the magical adventures of a wooden puppet whose quest to become a real boy leads him to learn about life, love and honesty. Tanghalang Pilipino is now accepting reservations for show buyers of Pinocchio, Gusto Mo Bang Maging Tao? The option for the show buyer is to have the play serve as a fundraiser for his/her chosen cause or as an opportunity to sponsor the viewing of the play by a special audience of his/her choice. Bring your kids to the CCP and let your holidays be filled with spectacle, music and merriment as you enter the magical world of Pinocchio.